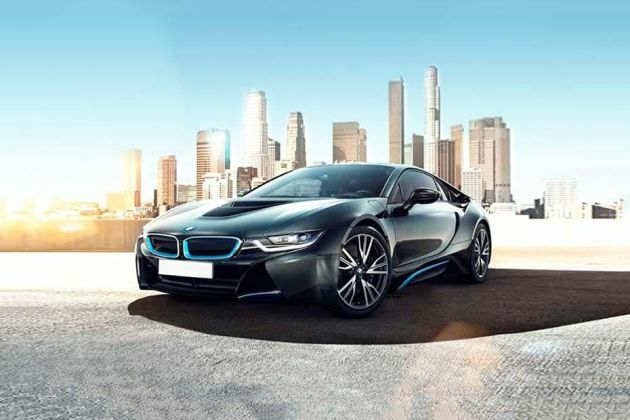 The German automakers greatest innovation, BMW i8 is officially arrived in the automobile market of India. This breathtaking super sports car has all the whistles and bells to steals the hearts of car enthusiasts across the globe. It is currently introduced as a completely built in unit (CBU) and is made available in one variant only. This sports cars front axle is equipped with an electric motor, whereas its rear one is fitted with a 1.5-litre petrol engine. The combination of these two engines help the vehicle to give away a peak mileage of 47.5 Kmpl, which is better than any other four wheeler in the automobile segment. With purely electric driving mode, this vehicle can achieve a top speed of 120 Kmpl owing to its eDrive technology. Its electric motor is further accompanied by a 5.2kWh battery, which takes about 2.5 hrs to get fully charged. However, with the help of BMW Wallbox charger, this time period goes down to less than two hours. Beside innovation technology, ultra-modern exterior and interior styling is the main highlight of BMW i8 Hybrid. Both its outside and inside styling represents the layered principle and is further highlighted by blue accents all round. At the same time, the elegant LED lighting pattern enhances its dynamic appeal. This newly launched sports car has a new design language based on layered principle adapted by the company. It has an aerodynamic front facade, sleek side facet and a rugged rear profile, which makes it look unique from every angle. To start with the rear, it has a very unusual bumper structure, wherein it is fitted with U shaped taillight cluster. There are a lot of metal and blue accents present on the bumper along with a pair of reflectors and courtesy lamps, which amplifies this facet. Coming to the sides, this vehicle gets scissor doors, which are concealed with handles for added elegance. The external wing mirrors are done up in high gloss black and are integrated with LED blinkers. This vehicle has massive fenders and yet, it looks very sleek from its side facet. These wheel arches can be fitted with either 'W' spoke or turbine styling alloy wheels, which further adds to its breathtaking stance. Its front facade looks even stunning owing to its extremely sleek headlight cluster and aerodynamic body structure. In the center, there is a kidney bean shaped grille with metallic and blue accents. The company's insignia has been placed on top of the hood, which is complimented by the expressive design on its bonnet. The interiors of BMW i8 Hybrid are tailor made for those individuals who prefers luxurious comfort. Although, it is a sports car, its cabin is fitted with four seats, which are ergonomically designed and covered with leather upholstery. The manufacturer is offering it with an exclusive 'Pure Impulse' character package that includes exclusive floor mats with leather border, gear selector switch in ziconium oxide ceramic and contrast stitching in BMW i Blue. Likes its exteriors, its dashboard too has a layered design and it is equipped with several innovative aspects like a touchscreen infotainment unit, iDrive touch controller and a few other BMW ConnectDrive aspects. The most attractive aspect of the cabin is its instrument cluster featuring a 22cm full color TFT screen that displays various functions of the car. This newly introduced vehicle is powered by a 1.5-litre petrol engine along with an electric motor that helps it to deliver exceptional performance. Its front axle is loaded with an electric motor that is accompanied by a Lithium-ion high performance battery. It is capable of producing 131hp of power and 250Nm of impressive torque. This power house is mated with a 2-speed steptronic transmission gearbox that powers the front wheels. The rear axle is loaded with an advanced 1.5-litre, 3-cylinder engine that displaces 1499cc. This engine has a pair of turbochargers, which allows it to unleash a maximum power of 231bhp at 5800rpm in combination with a hammering torque of 320Nm at just 3700rpm. This petrol mill is coupled to a six speed automatic transmission gearbox. Together with both these power houses, this BMW i8 Hybrid touches the 100 Kmph speed barrier in just 4.4 seconds and goes up to 250 Kmph. At the same time, it has the ability of giving away a peak mileage of 47.45 Kmpl, which is rather impressive. All its four wheels have been fitted with sturdy set of internally vented disc brakes featuring superior calipers with high gloss black finish. This proficient braking mechanism is further assisted by the advanced ABS and brake assist system along with cornering brake control function. It also has a superior suspension system that is capable of dealing with all the jerks and bumps caused on roads. Furthermore, it is also incorporated with an electrically assisted steering system that consumes less power and yet offers greater response to make handling simpler. This all new sports car has all the latest comfort features, which pampers the occupants and provides luxurious traveling experience. It has a list of features including foldable front armrest with storage compartment, door sill trims in carbon styling, interior mirror with automatic anti dazzle function, instrument cluster with leather trim, sport compartment package and electrically adjustable front seats including heating function. In addition to these, it also has multi-functional steering wheel, lights package with three ambient lighting design and headliner anthracite. The manufacturer has also blessed with a few BMM ConnectDrive aspects like an iDrive touch controller and a high resolution 26cm color display along with a few connectivity ports. At the same time, it is also blessed with a 360Watt HiFi surround sound system designed by Harman Kardon that includes a total of eleven speakers. This luxury hybrid sports car has several advanced protective features, which safeguards the occupants like no other vehicle in this segment. The list of features include acoustic protection for pedestrians, warning triangles with first aid kit, tyre puncture repair kit, electronic engine immobilizer with alarm system, eight airbags and an electric parking brake. Furthermore, it also has ABS with brake assist system, cornering brake control along with dynamic stability and traction control system. 1. Exceptional fuel economy without compromise in performance. 2. Breathtaking exterior and interior styling is its advantage. 1. Its price range is way too expensive for Indian automobile market. 2. Rear cabin seating space is congesting. బిఎండబ్ల్యూ ఐ8 రోడ్స్టర్ Comfort & Convenience "Lithium-ion high-performance battery /n Cruise control with braking function /n Dynamic Damper Control /n Electrically assisted steering /n Intelligent Plug-in hybrid technology with 4WD /n Wallbox Charger /n Comfort Access system /n Armrest front, foldable with integrated storage compartment /n Park Distance Control (PDC), front and rear /n Navigation system Professional with 3D maps /n Driving Assistant Package /n Three-point seat belts including belt stopper, pyrotechnic belt tensioners and belt force limiters /n Tyre Puncture Repair Kit /n "